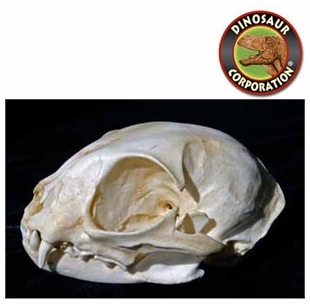 Black-Footed Cat skull replica is cast from original specimen. Felis nigripes. S. Africa. The black-footed cat, also called small-spotted cat (Felis nigripes), is the smallest African cat, and is endemic in the southwest arid zone of the southern African subregion. It is one of the lesser-studied African carnivores. The black-footed cat is one of the smallest cat species. Adult resident males weigh on average 1.9 kg (4.2 lb) and a maximum of 2.45 kg (5.4 lb). Adult resident females weigh on average 1.3 kg (2.9 lb) and a maximum of 1.65 kg (3.6 lb). Males reach a head-to-body length of 36.7 to 43.3 cm (14.4 to 17.0 in) with tails 16.4 to 19.8 cm (6.5 to 7.8 in) long. Females are smaller with a maximum head-to-body-length of 36.9 cm (14.5 in) and tails 12.6 to 17.0 cm (5.0 to 6.7 in) long. The shoulder height is about 25 cm (9.8 in).